INDIANAPOLIS, Tuesday, May 12, 2015 – One of the major storylines for the 99th Running of the Indianapolis 500 is Helio Castroneves’ continuing quest to join the four-time winners club. The answer to that quest is still 12 days from being revealed, but the 40-year-old Team Penske veteran showed off a car on Tuesday that could be up to the task. 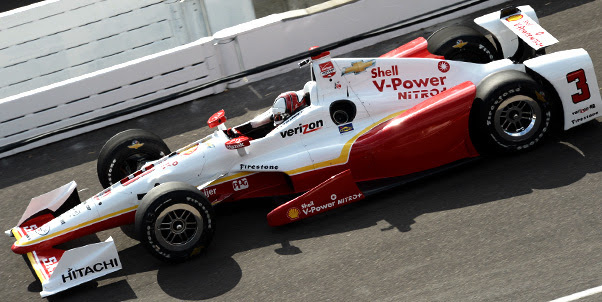 Castroneves ran the fastest lap in a busy second day of practice for the “500,” 227.514 mph in the No. 3 Shell V-Power Nitro+ Chevrolet. Teammate Simon Pagenaud was second in the No. 22 Avaya Team Penske Chevrolet at 227.382 mph. A total of 34 drivers turned 1,958 laps on the 2.5-mile oval under partly cloudy skies. Another full day of practice is on tap for Wednesday from noon to 6 p.m.; gates open at 10 a.m. and admission is $15 with children 12 and under free. Simona safe: Andretti Autosport’s Simona de Silvestro had her second fire scare in four years at Indianapolis on Tuesday when her No. 29 TE Connectivity Honda had a fuel leak that lead to a fire shortly after 2 p.m.
De Silvestro steered to a stop and climbed out safely but the car sustained significant damage. The Swiss driver sustained second-degree burns on her hands in a 2011 Indianapolis 500 practice crash and also had a car catch fire in 2010 at Texas Motor Speedway. Little 500 champs at IMS: Winners of Indiana University’s Little 500 bicycle races will be at IMS on Wednesday morning for a photo opportunity and a tour. The Little 500 began in 1951 in Bloomington as an event to help raise scholarship funds for working students and was founded by IU Foundation director Howdy Wilcox, whose father Howdy Wilcox Sr. won the 1919 Indianapolis 500. The Little 500 features 33 teams starting in 11 rows of three in a 200-lap race similar to the Indianapolis 500. This year’s winners of the men’s and women’s races, Sigma Phi Epsilon and Kappa Alpha Theta, will join other top finishers and IU Student Foundation staff on the visit. The photo opportunity will begin just after 11 a.m. on Victory Podium. Finding opportunities: Middle and high school students from across Indiana gathered in the Indianapolis Motor Speedway pavilion on Monday and Tuesday for the second annual M-STEM3 500 fair. The Indianapolis Motor Speedway partnered with Purdue University and various other institutions for the fair, aimed at educating students about the various career opportunities and educational opportunities connected with INDYCAR and racing in general. Many facets of education are represented at M-STEM3 including Medical, Advanced Manufacturing, Marketing, Technology, Engineering, and Mathematics. M-STEM 3 combines all of these facets together and uses INDYCAR as real-world examples of these areas of education. A newer program that the Purdue University M-STEM3 program introduced is the high school go-kart program. This program is open to 11th and 12th grade students and provides a refresher course in math skills to help students transition into college math levels and courses. The high school race will be run on Wednesday before the Purdue International EVGrandPrix and allows college students to mentor the high school students. The go-kart program also incorporates the other facets of education in its program, including but not limited to, marketing, mathematics, engineering, and technology. Sponsors of the M-STEM3 500 along with Purdue and IMS include General Motors, Dallara, Indiana Manufacturers Association, Conexus, Vincennes University, Lincoln College of Technology, Ivy Tech, EmployIndy, Firestone Racing, Major Tool, Allison Transmission, Edge Factor, Gene Haas Foundation, Mastercam, Indiana Department of Education, United States Auto Club (USAC) and EVC Racing. One thousand students attended the fair over two days. Purdue University has already signed a contract and M-STEM3 will be returning to the Indianapolis Motor Speedway next year for its third fair, continuing to help students get involved in the sport of racing and helping protect the viability of the sport we love. Staff update: The Indianapolis Motor Speedway has announced that Peggy Swalls will be leaving the organization as a full-time employee May 31, 2015. She will still be involved, although she will serve in a part-time consulting role with the Hall of Fame Museum beginning in January 2016. Peggy began her career following graduation from Indiana State University in 1970, working in Tony Hulman’s office and assisting with credentials. She moved up through the ranks and has held a number of senior management positions including Corporate Secretary, Vice President of Administration, Director of Ticket Operations and Director of Customer Service. Peggy became the ticket director in 1980 and led the team that transitioned from a manual operation to a custom designed computerized ticketing system. Peggy’s team created and implemented the seniority system which rewards IMS customers for loyalty and longevity in ticket purchasing. With this change in policy, IMS moved from ample ticket availability to being oversold in just two short years. She and her staff developed the policies and procedures for ticketing inaugural events, including the Brickyard 400, F1 US Grand Prix, MotoGP, the PGA Senior’s Golf Tournament and The Walt Disney World 200. Peggy has been responsible for managing all of the suites as well as the outside paid parking lots. During her tenure she forged relationships and friendships with ticket customers, colleagues, drivers, mechanics, car owners, suite holders, hospitality clients, caterers and sponsors. She has always treated her position with the Speedway not as a job, nor a career, but as a way of life. As the Vice President of Administration, Peggy managed 26 full time employees as well as hundreds of seasonal ticketing and parking employees. Peggy is passionate about the Speedway and most especially the fans, many of whom have become her friends. 2015 Ticket Information: Ticket information is available for all racing events at the Indianapolis Motor Speedway in 2015 – the 99th Indianapolis 500, Brickyard Vintage Racing Invitational, Lilly Diabetes 250, Crown Royal Presents the “Your Hero’s Name Here” 400 at the Brickyard and Red Bull Indianapolis GP.